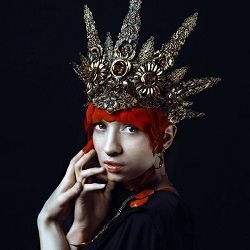 The Hysteria Machine shop is home to unique fantasy headdresses and other wonderful accessories. Cosplay enthusiasts, fans of the macabre and those of an eccentric disposition will enjoy many of the wares on offer here. You will find realistic deer antlers and ram horns, resin cast crow skull hair clips, partridge skull rings and bat skull necklaces! There are also evil bunnies, metalwork eye patches, Day of the Dead headdresses and lots more curious items for you to cast your inquisitive eyes over. Custom requests are welcome, so if you have something specific in mind, get in contact via the links.